With so many new indie cafes opening in town each month, it's hard to keep up with the coffee trend in Hong Kong. Thanks to the local baristas who put in the hard work educating the public more about third-wave coffee culture, the cafe scene in Hong Kong has definitely matured a lot in the past few years. Here's a glance of our top 10 picks in town, where you can get the perfect flat white and pour overs (hand-dripped coffee). Coffee is a serious affair at Halfway Coffee and drinks are served in the owner's beloved vintage Chinese porcelain cups. If you grab a coffee-on-the-go, their paper cups are also printed with these classic patterns. 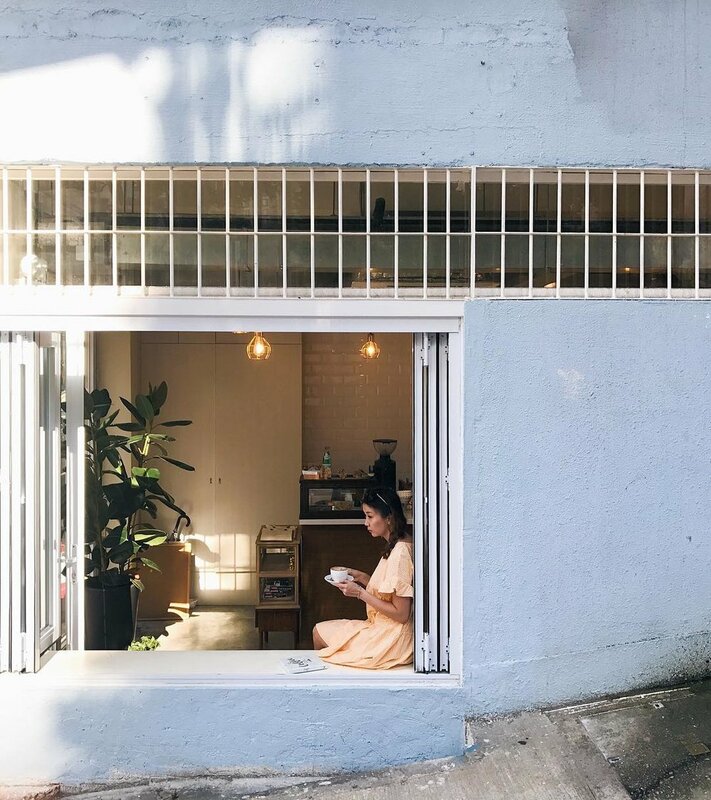 We’re not even slightly surprised that Halfway is one of the most Instagrammable spots of the year and the quality of their coffee truly speak for themselves. For those who prefer a milder caffeine kick, there’s also a wide range of tea selection available. It's a popular spot during lunch, and as space is limited, it’s best to grab your brew either early in the morning or after lunch. The little shop is tucked away on Tung Street in Sheung Wan, and the vintage toy stall that’s right across the cafe is also worth checking out. The local speciality coffee chain has been taking over the coffee scene in Hong Kong for the past 10 years. The branch on Stanley Street is a keeper in our book, and the staff maintains a great consistency with their coffee beverages under the guidance of Coco's manager Kim Yeung. Our favourite is their iced cappuccino, which always does the trick to kickstart the day. If you prefer something refreshing and not milk-based, the cold brew is a good alternative. The cafe hosts music events with local artists from time to time, which you can find more details on their Facebook Page. Coco Espresso currently has 5 locations, including their beautiful space at 701 Roastery at Kwai Hing. The minimalist decor at NOC’s branch on Gough Street sets the shop apart from the bustling neighbourhood, and the 2-floor cafe has plenty of space for coffee lovers and digital nomads. We love the clean, white space and the natural sunlight coming in through the windows upstairs. NOC’s team continues to keep their coffee standards on par at their second branch and has a food menu with items such as avocado toast with scrambled egg, acai bowls and egg benedicts. Unlike other cafes in Hong Kong, Amber solely focuses on crafting their coffee and only has a limited selection of pastries. The coffee bar is opened up by Dawn Chan, who won the Hong Kong Barista Championship twice and the 4th place of World Barista Championship in 2015. Besides the basic espresso-based offerings, Dawn also makes some of the best pour overs in town, and it’s not to be missed! Signature drink If you want to learn more about coffee and how to brew it at home, ask the baristas for tips, and they're always up for a good chat. We also love the fine Scandinavian cups and Amber opens as a cafe by day and wine bar by night. A small selection of European beer such as Mikkeller and To Øl is available on the drinks menu too, and it’s a good spot for a quick Happy Hour sesh if you're in the area. Opening Hours: 8 am - 9:30 pm Monday to Friday, 10 am to 6 pm Saturday to Sunday. Brew Bros Coffee is one of the few Aussie style cafes in town, and they use coffee beans from Melbourne’s Market Lane Coffee. Their signature cold brew takes 21 hours to make, and while it’s definitely on the pricier side based on its portion, the meticulous care taken to brew it really shows in the cup. Besides coffee, they also serve chai latte made with Prana Chai and luscious matcha soy latte. Pastries, breakfast and lunch menu are also available if you want to grab a bite. They have another location on Hillier Street in Sheung Wan and the food menu there is slightly different. Opening Hours: 9 am to 5:30pm, Monday & Wednesday to Sunday. Closed on Tuesdays. Formerly known as Peel Street Espresso Bar, the cafe offers strong Aussie style coffee, fresh pastries and bagels early in the morning. Owner Scottie Callaghan won the World Latte Art Championship and Australian Barista Championship previously and had mentored many local baristas since he moved to Hong Kong from Australia. The decor of Fineprint makes it one of the most chic cafes in town. The golden communal table sits at the centre of the cafe, and there are also two seats by the window. The daily food menu is written on a black chalkboard on the wall and changes daily based on what's in season. Sit outside with a book and coffee while enjoying people-watching on the street. The cafe also turns into a wine and cocktail bar at night. Opening Hours: 6am - 6pm, Monday & Sunday. 6am until late Tuesday to Saturday. The owners, William and Diana, name their cafe after their Shiba Inu, Black Sugar, and you can find the pup on duty greeting customers every Sunday morning until 1 pm. With plenty of tables and free wifi, Black Sugar Coffee is perfect for a work sesh with a good cup of flat white and a slice of homemade raspberry cake (inspired by the ones from Revolver in Vancouver) on the side. The cafe is also an exhibition space for local artists to showcase their work and it changes every one to two months. Friends and family of the owners would bring back coffee beans from their travels, so look out for speciality beans from Europe, Korea, the States on rotation and ask William to make you a pour over! Cupping Room is another local coffee chain that has been rising in recent years, and it’s hard not to go inside for a cup when their sign beams about their barista/owner Kapo's achievement of winning second place at the World Barista Championship. Coffee are served in ceramic cups made by Heath Ceramics from San Francisco at the Central location and offers an all-day brunch menu. Some cafes never get the ratio of flat white quite right, but one can trusts Cupping Room to get it perfect every time. There’s limited seatings on the ground floor, but the window seats are great if you want to grab a quick cup. Otherwise, go upstairs for more comfortable seatings. Other locations include the Wan Chai and Sheung Wan branch, and their Roastery is up on the hill on Po Hing Fong in Sheung Wan. Opening Hours: 8 am - 5pm, Monday to Friday. 9 am to 6 pm, Saturday to Sunday. We’re quite sure Why50 is the only cafe in Hong Kong that offers Dirty on the menu. Inspired by Bear Pond Espresso Bar in Tokyo, Dirty is a drink that’s made with a shot of hot espresso sandwiched between two layers of chilled milk, topped with an extra shot of espresso after. The barista there uses a sleek Slayer espresso machine, and there’s a rotation of coffee beans ranging from Vancouver-based roaster 49th Parallel and The Barn from Berlin. And yes, brunch is also available here so you can eat until your heart is content. Opening Hours: 8 am to 6 pm, Monday to Friday. 8:30 am to 6 pm Saturday to Sunday. Located in Sai Kung, Moni Stand might seem too far to take the trip out there just for a cup of coffee, but there’s more than meets the eye. The cafe is tucked away on the first floor of an old Tong Lau, and once you set foot in it, you’ll see shelves of vinyl records and a beautiful, high-end stereo system. The owner Peter is a huge vinyl collector, and he’s happy to help out with recommendations or help you to look for records from a specific artist. 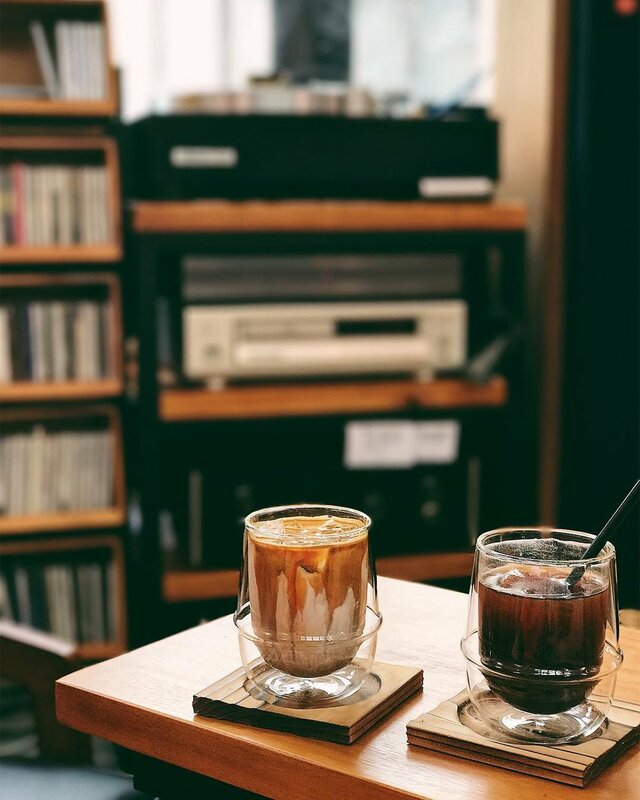 You can listen to the records for free with the stellar speakers, which makes the experience even better when you have a good cup of brew in hand. The other owner Monica is known for her superb hand-dripping skills and as Moni Stand is the only importer that carries beans from American roaster NinetyPlus, pour over fans should pay her a visit when she's on shift (you can check their Facebook for her availability). There are limited seatings and can get incredibly busy during the weekend, so either go there when the cafe just opens or go on a weekday. Make sure you check their Facebook page to check their opening days and hours since it changes monthly. Opening Hours: Check Facebook Page for their opening hours and monthly calendar. * Want to explore like a local when you travel in Hong Kong? Check out our private and group city & food tours here.